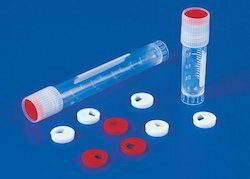 Item code: ETPW-0118 These polypropylene tubes provide excellent option for RIA, coagulation & bacteriology etc. 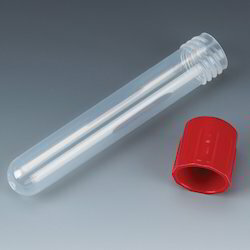 The cap in screwed on to the tube & hence this tube can be filled up to the brim. Material :Polypropylene Code No. Perticulars Packing ETPW-0118 16 x100mm Ext. Thread 500Pcs. Adding to the existing range of Cryo Vials is this vial which has internal thread in it. The cap fitted with an O-ring screws in to the vial and makes it a leakproof Cryo Vial. 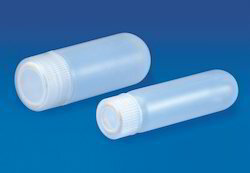 These vials are provided with white, prominent graduations and a long marking area for sample identification. Cryo Rack is moulded in Polycarbonate making it tough, durable & autoclavable. This handy rack can hold 50 vials at a time. 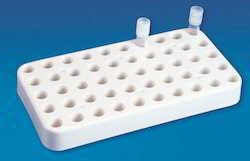 The unique feature of this rack is that vials can be unscrewed without actually picking them up as the vial will lock in every well and hence will not twist. 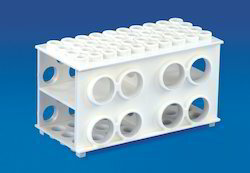 This rack is provided with four anti skid rubbers & each well is identified with an alpha-numeric index. 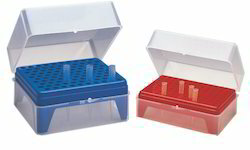 These unique boxes are moulded in Polypropylene and are therefore autoclavable. The Box itself is clear providing an excellent view of the tipe inside while a table like structure is provided inside to hold the tips. 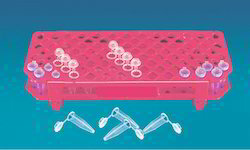 The tip holding spaces are uniformaly placed to facilitate the use of multi channel pipettes. The cover is joined to the base through ball catcher hinges and provides excellent protection to the tips. 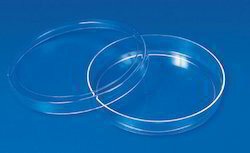 These Racks are clear acrylic construction with polycarbonate posts.0160 has a capacity to hold 60 petri dishes of 90 mm size while 0160 one can hold 56 petri dishes of 60mm. These racks are very useful during inoculation, incubation & Storage. Visibility from all sides enables the culture to be seen & checked during incubation. These two-tier versatile racks, made of polypropylene, are autoclavable & can be used dry, in water baths or in freezers. These racks are provided with alpha numeric index for easy sample identification. Racks are stack able even when loaded and have purpose designed lable spaces on each side.